Sophomore forward Brandon Randolph throws down a dunk against the University of Oregon during his freshman season on Jan. 13, 2018. Streams of cardinal-and-blue-clad fans left the exits of the McKale Center in the waning minutes of Thursday's Arizona basketball game against the University of Washington. Much of the announced crowd of 13,732 vacated their seats before the final horn sounded, signaling a seven-point loss that typified much of the Wildcats' season to date. The Wildcats (14-9, 5-5) trailed for most of the night, holding an advantage for roughly two minutes of game time, eventually falling to the Huskies, 67-60. The defeat extends the team's recent winless streak to four games, marking the Wildcats' longest slide in a decade. The two sides were neck-and-neck at the half, with the visiting Huskies (19-4, 10-0) holding a 29-28 lead through 20 minutes of action. That was as close as the home side would get, as the Wildcats would struggle mightily from the field in the final 20 minutes, hitting 10 of 28 field goals (35.7 percent). The lone Wildcats to finish the night in double figures were graduate transfer guard Justin Coleman and redshirt junior forward Chase Jeter, who finished with 16 and 12 points, respectively. 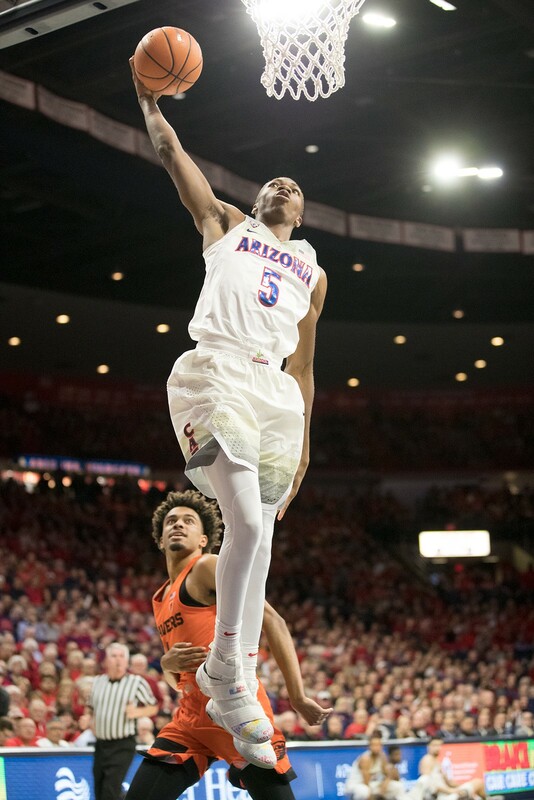 Coleman, who transferred to Tucson from Georgia's Samford University, believes the Wildcats can find a positive in their recent woes. "I'm glad we going through this adversity because it brings us closer as a team," Coleman said. "We have eight games left, we're going to try and make the best we can in these last eight games and play for each other." The eight-game gauntlet that Coleman alluded to begins this Saturday, when Washington State comes to Tucson, fresh off a 91-70 win over ASU on Thursday night. The Cougars (9-14, 2-8) and Wildcats tip off at McKale at 5:30 p.m. local time, with the Pac-12 Network carrying the contest. Coleman said the team is inspired to finish the season strong, playing in honor of assistant coach Mark Phelps, who was suspended with the intent of being fired by the University on Wednesday for alleged improprieties. "He's still part of us as a team. The time he was here, he taught me how to be a better player, better man," Coleman said of Phelps. "I know a couple of guys who reached out and told him how much they appreciated him as a coach, as a guy, as a great person in the program but for right now, we've just gotta move forward, continue to get better and take it day-by-day." Sean Miller refused to address any off-the-court subjects in his postgame remarks, choosing to focus on his team's play. Miller heaped praise on the Huskies, who have a shot at being the first Pac-12 team in conference history to go 18-0 in league play. The ninth-year Arizona coach said that second-year coach Mike Hopkins' zone defense was tough to crack, which contributed to his squad's 37.7 percent field goal percentage. "They're the best defensive team in our conference," Miller said. "There are times when Oregon's been the best defensive team in our conference, there are times when we've been the best defensive team, but whatever they do and whatever you do, you wanna do it well. And they play their zone very well." Miller said that Austin Carroll, who previously served as the team's assistant director of basketball operations, will fill Phelps' role on his staff going forward. The longtime coach believes his players' commitment to the now-former assistant coach stems from their recent struggles on the court. "You know, our players are young people in college, you know, they're very emotional," Miller said. "When you go through a long season in some senses, the more seasons you grow attached to people and of course they're attached to each other, they're attached to people that work with them."